Unfortunately, not every community in Florida is an economic engine like Tampa, Orlando, or Miami. We need Enterprise Florida, Visit Florida, and the Governor’s Growth Fund. In the interest of the economic well-being of our community, our Florida Legislators and Governor need to fight for funding economic development and tourism throughout the state of Florida. Since the 1700s, the Pensacola region has occupied a place of business importance due to its trade and commerce significance – and today a number of major industries benefit from our stable economy and positive business climate. Our area is a great place to live, work and raise a family. We are working hard to let the world know about our great community, amazing weather and beautiful beaches. The world, however, has a lot of beautiful beaches and weather – and competing with other communities to bring jobs that pay wages above the current county average takes time, persistence and community support. That’s where economic development entities such as FloridaWest EDA and Enterprise Florida, Inc. come in. The primary purpose of economic development and your local and state economic development entities is to generate wealth for the community. By increasing the amount of new money in the community, we are supporting the growth of the local economy. That is why FloridaWest EDA and the Pensacola-Escambia Development Commission exist. Together we use all the assets at our disposal to encourage private business to invest capital in our county and most importantly provide better job opportunities for our citizens. We do that by helping startups, expanding existing businesses and recruiting new companies to diversify our economy and our workforce. 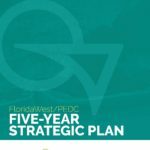 FloridaWest EDA, in partnership with Pensacola State College, manages Co:Lab Pensacola, a business incubator in downtown Pensacola which in 2017-2018 created 80 jobs and generated over $9.5 million in gross sales. Enterprise Florida, Inc. (EFI) supports Co:Lab as well through programs such as the Small Business Development Center which provides consulting assistance, small business loans and business plan reviews that contribute to small business success. EFI, with an International Trade Representative here in Escambia County, also provides assistance to small and medium-sized companies interested in new markets and gives them the chance to grow from small businesses to large ones competing on a global stage. Strategic partnerships with SpaceFlorida and the Florida Southeast US/Japan Association (‘SEUS/Japan’) provide critical support leading to new growth. Every day, Northwest Florida is in competition with all the other exceptional locations around the South for good jobs. It is essential that we have local and state support to draw business and job opportunities to our community. We need tools that are just as important to support our existing business as they are to recruit new business. Without a robust toolbox of resources, our companies and the employees who work for them may find it necessary to leave the area or state to find a community that can provide the support they require. Money that comes into our community from economic development efforts to attract new jobs has been criticized as “corporate welfare.” That could not be further from the truth. Public investments to create new jobs in Florida can have a five hundred percent return for the community within just a few years. Companies that expand and locate here pay salaries, buy goods and services, spur home construction, support new retail centers, and generate tax revenue– a ripple effect for the community many times greater than the public funds spent. We need your representation to help keep our communities and state competitive.